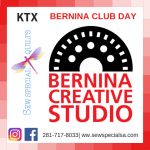 BERNINA Creative Studio will feature 3 lessons each month: Embroidery, a Technique, and a Project **Registration is required. Class & Club Cancellation: Please call the store to cancel. 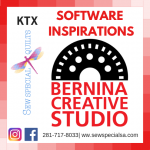 KTX 281-717-8033. You may receive a store credit when you cancel 72 hours before the scheduled class if we can fill your spot. Store Credit cannot be given on No Shows. 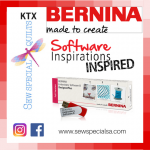 The BERNINA Software Inspirations will be held monthly and will encourage you to use your software and embroider in more creative ways. 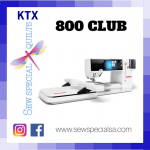 Get ready for this fun SKILL BUILDER club. 4 DesignWorks lessons will be included throughout the year. 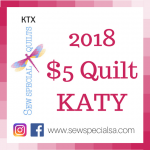 **Registration is required. 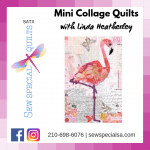 Class & Club Cancellation: Please call the store to cancel 281.717.8033 You may receive a store credit when you cancel 72 hours before the scheduled class if we can fill your spot. Store Credit cannot be given on No Shows.